Just For Fun … Did you ask “Why French BioBeach” ? PLAINSBORO, N.J., Sept. 17, 2014 (GLOBE NEWSWIRE) — Integra LifeSciences Holdings Corporation (Nasdaq:IART) and Medtronic, Inc. today announced an agreement in which Integra will acquire Medtronic’s MicroFrance and Xomed manual ENT and laparoscopy instrumentation lines for approximately $60 million in cash. Integra expects the transaction to close, subject to customary closing requirements, in the fourth quarter of 2014. The MicroFrance business, which includes Xomed’s manual ENT instruments, designs, manufactures and sells reusable handheld instruments to ear, nose and throat (“ENT”) and laparoscopy surgical specialists. Under the terms of the agreement, Integra will acquire a portfolio of approximately 4,000 MicroFrance and Xomed manual ENT and laparoscopic surgical instruments, as well as the St. Aubin le Monial, France manufacturing facility. Integra plans to fund this transaction with cash held outside the U.S. The addition of the MicroFrance business will expand Integra’s Instruments presence outside the US. In the most recent annual reporting period, sales from the products being acquired totaled approximately $30 million, two-thirds of which were generated outside the U.S.
“We are excited about adding the MicroFrance business, which advances our strategic objectives in both our Instruments and International businesses while meeting our profitability and return goals,” said Glenn Coleman, Integra’s Chief Financial Officer. Integra expects to record approximately $27 million to $30 million in revenue and approximately 10 cents of adjusted EPS in calendar 2015 from this acquisition. The earnings accretion should rise after the first year once certain sales transitions are complete. The Company expects the acquisition to contribute less than $5 million in revenue and be neutral to earnings in the fourth quarter of 2014. The transition and integration is expected to be completed by the second half of 2015. French BioBeach has welcomed a regional economic mission from the PACA region (South-East of France) in San Diego, California, on the occasion of the “2014 BIO International Convention”, that took place from June 23 to 26. The objective was to promote the Biotech sector from Provence-Alpes-Côte d’Azur and concretize an action program initiated 2 years towards the United States, especially with California and San Diego, considered as a territory of excellence for Biotechnologies. Led by Patrick Allemand, 1st Vice President of the Region and President of the new Regional Agency for Innovation and Internationalization of Companies (ARII), Dominique Esteve, President of the Regional Chamber of Commerce and Industry (CCIR) and Jacquie Berthe, Chairman of the Competitiveness Cluster Eurobiomed, this mission involved all regional economic actors involved for several years in trade with San Diego, and gathered under the “South Bio Alliance” label: the economic development agencies Provence Promotion and Team Côte d’Azur, the competitiveness cluster / PRIDES Mediterranean Sea (Pole Mer), the Southeast Technologies Transfer Accelerator Society (SATT South East), as well as companies from Provence-Alpes-Côte d’Azur (Txcell, Syncrosome, Trophos, Iris Pharma, Nicox, Provepharm , Neuroservice and Medicodose Systems) and Languedoc Roussillon (Medincell, Ciloa and Régimbeau Law Office). The objective was to implement real and lasting partnership and economic development actions between the Provence-Alpes-Côte d’Azur Region and San Diego. Beyond the Biotechnology industry, it was also the occasion to identify opportunities for economic exchanges in other sectors, and the terms of partnership. All the pictures from this mission can be found at the following link. Officials of San Diego’s Biocom and Eurobiomed, an agency in southeastern Francce, sign an agreement to help biotech companies do business in each other’s regions. From left, Magda Marquet, founder of Althea Technologies and chair of Biocom; Jacquie Berthe, president of Eurobiomed and a scientific director of Sanofi-Aventis; and Joe Panetta, president and CEO of Biocom. Formally establishing a relationship years in the making, San Diego’s life science trade group, Biocom has signed a economic development pact with a French governmental agency. The deal between Biocom and Eurobiomed in southeastern France commits them to help their respective biomedical companies establish ties and do business in each other’s regions. Already, one French biotech company, Neuroservice, has joined Biocom, said Stéphane Richard, president and founder of French BioBeach, a San Diego Franco-American biotech networking group. Another company, Roowin, is in the process of joining. 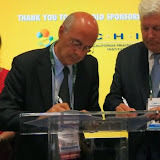 Biocom and Eurobiomed officials signed the deal Tuesday morning in the French pavilion at the Biotechnology Industry Organization’s 2014 annual convention, held this year at the San Diego Convention Center. About 15,000 people are expected to attend through Thursday from 47 states and 65 countries. 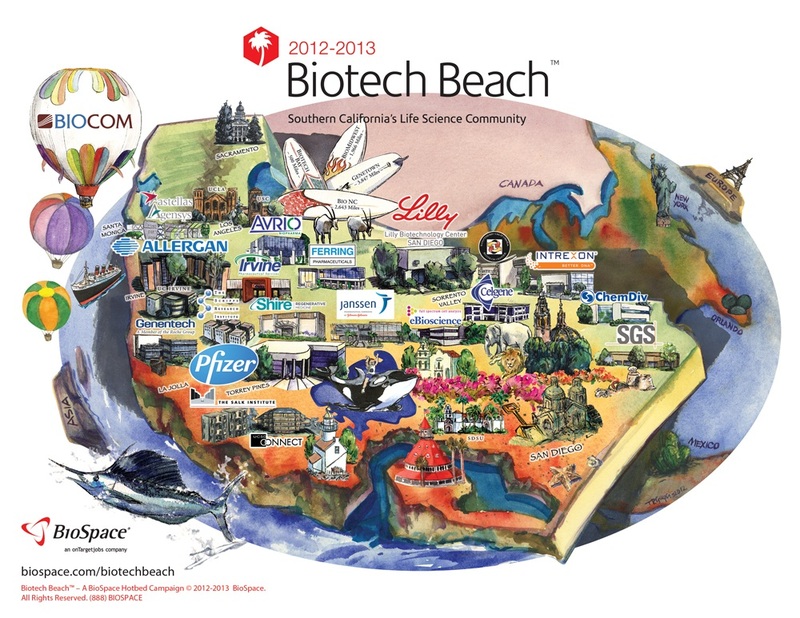 BIO 2014 is the world’s biggest biotech convention. It was previously held in San Diego, itself a top global biotech center, in 2001 and 2008. Eurobiomed promotes biomedical economic development in the regions of Provence-Alpes-Côte d’Azur and Languedoc Roussillon. The territory includes the cities of Marseille, Nice and Montpellier on the Mediterranean coast. With four major university hospitals the area provides a strong health care infrastructure to complement research, said Jacquie Berthe, president of Eurobiomed. Eurobiomed has more than 400 companies as members, including such major companies as Sanofi-Aventis, where Berthe is the scientific director of Sanofi’s center in Montpellier. This fall, Biocom will return to France, Joe Panetta, Biocom’s president and CEO, said at the signing ceremony. Last year’s visit was arranged by French BioBeach, with help from Eurobiomed, Team Côte d’Azur, Provence Promotion and the regional economic development agency, MDER. Panetta wrote about the delegation’s trip to France last year in U-T San Diego. Just to the north of Eurobiomed territory, the business development group Lyonbiopole also sent a delegation to the BIO convention. The group represents a biomedical cluster in and around the city of Lyon. Lyonbiopole’s Florence Agostino-Etchetto attended the Eurobiomed signing. Seragon Pharmaceuticals Inc., a leader in developing drugs for hormone dependent cancers, today announced a definitive agreement with Genentech, a member of the Roche Group, (SIX: RO, ROG; OTCQX: RHHBY) whereby Seragon will be acquired for $725 million in cash up front along with $1.0 billion in contingent development milestone payments that could bring the total transaction value to $1.725 billion. The acquisition includes Seragon’s entire SERD program, including its most advanced compound, ARN-810, a next generation SERD that is currently being evaluated in a Phase I trial in patients with estrogen receptor positive (ER+) metastatic breast cancer. Seragon, founded in August 2013, is an independent venture backed biotech company based in San Diego that was spun out of Aragon Pharmaceuticals, following its acquisition by Johnson & Johnson. Following the spin out, Seragon retained many members of the management and R&D team, including Richard A. Heyman, Ph.D., Chief Executive Officer and co-founder of Aragon and Seragon Pharmaceuticals. The Seragon team focused its attention to develop game changing therapies targeting ER+ breast cancer and other estrogen driven cancers including endometrial and ovarian cancers. “This acquisition represents an ideal transition between biotech and pharma and may provide an optimal outcome for the SERD program and the breast cancer patient community. The Seragon team has been committed to bringing new therapies to cancer patients and we are excited to have Genentech carry forward these programs. Genentech has repeatedly demonstrated its leadership position the oncology field, and their development and commercial capabilities in the breast cancer area are unparalleled,” said Rich Heyman. In the US alone, there are approximately 229,000 new breast cancer diagnoses and 40,000 deaths/year related to breast cancer. The vast majority of these cancers are dependent on estrogen signaling and women with ER+ breast cancer are treated with 1st generation anti-hormonal therapies such as tamoxifen or the aromatase inhibitors. These therapies are initially effective, but many patients experience disease progression due to acquired resistance. Seragon’s SERDs are next generation therapies that have a dual mechanism of action in that they both bind to the estrogen receptor to antagonize hormone action, and they promote receptor degradation. These SERDs are initially being developed for the treatment of women with late-stage, progressive ER+ metastatic breast cancer, but they also have potential in treating patients with early-stage breast cancer. Furthermore they also may offer an opportunity to be the cornerstone for future combination therapies. “I would like to sincerely acknowledge Rich and the entire Seragon team for their commitment and dedication in advancing the ground breaking science behind both Seragon and Aragon. In just five years since the founding of Aragon, in The Column Group’s offices, this team has advanced multiple compounds from an early idea to a clinical development program targeting hormone dependent cancers. I would also like to thank Dr. Charles Sawyers for his foundational work helping to elucidate the molecular determinants of resistance for hormone dependent prostate cancer. This is an ideal path, which will hopefully translate to improving the lives of patients,” said Peter Svennilson, Founder and Managing Partner of The Column Group and Chairman of both Seragon and former Chairman of Aragon. The closing of the transaction is subject to customary closing conditions, including clearance under the Hart-Scott-Rodino Antitrust Improvements Act. The transaction is expected to close in the third quarter of 2014. Wilson Sonsini Goodrich & Rosati served as legal advisor to Seragon Pharmaceuticals in this transaction. Seragon Pharmaceuticals is focused on the development of small-molecule drugs for the treatment of estrogen receptor dependent breast cancer. Seragon Pharmaceuticals’ orally active selective estrogen receptor degraders (SERDs) represent a potential new treatment for progressive metastatic breast cancer that may circumvent the problem of resistance to anti-hormonal therapies. The company’s lead SERD compound, ARN-810, is currently being evaluated in a Phase I clinical trial in breast cancer patients who have failed first generation anti-hormonal therapies such as tamoxifen and aromatase inhibitors. In addition to endocrine-resistant breast cancer, SERD agents also have potential to treat other estrogen dependent cancers such as endometrial and ovarian cancers. Seragon is a privately held company founded in 2013 and headquartered in San Diego, California. Seragon was financed by legacy Aragon investors including, The Column Group, OrbiMed Advisors, Aisling Capital, TopSpin and venBio. In the latest of our series to help the Scottish business community, Gareth Magee gives an insight into how to do business in France. Our close neighbour, France, boasts the fifth largest economy in the world, just ahead of the UK, which sits at number six. A mere few billion separates us, as well as the channel, and perhaps this is why relations between the UK and France go back a long way and continue, albeit more successfully, today. The major countries investing in France are, as you would expect, the USA, Germany and the UK, as well as Japan and Sweden, and moving into France is popular – more than one million businesses have been set up over the past five years – that’s 550 per day. With over 20,000 subsidiaries of international companies and many, many big brands in the country, there’s no shortage of ‘incomers’. However close we are, France is distinctly different when it comes to business. The French culture dictates its own way of doing things, and it’s wise to work this out before heading South, hopping on the Eurostar and setting out your stall on the Champs Elysees. Doing business in France appears quite formal and proper greetings and manners are essential. Although English is commonly used for business, use of some French language is also tremendously important. Even if you are not fluent in French, a well-researched attempt goes a long way – or for more complicated deals, having a French ‘fixer’ is worth its weight in gold. At the very least, always use Monsieur or Madame, until otherwise invited. However, the French formality is not all that it seems. The French are a social, warm society, and personal relationships and alliances are equally as important. As is lunch, which can last a long time. Additionally, forget making your big push in July or August. To all intents and purposes, France is closed during these months – the rest of the year is business as usual though. So, why do business in France? Well, for a start the level playing field is a boon. Most countries have different rules for indigenous businesses and inward investors – not France. Buying, selling, renting, acquiring, establishing – the rules are the same. Costs for property and labour are relatively low, so if you want a base in mainland Europe, France is a good option. With an economy similar to that of the UK and assuming cultural differences can be overcome, venturing into France doesn’t sit far outside the comfort zone of a UK entity. There are some tax incentives available for those investing in France, however these are mainly concentrated in areas of poor industrialisation, or where the deal involves taking over an ailing company. Innovation is also rewarded, particularly investment in research – which is partly the reason that France has attracted a healthy biotech and R&D sector. That the tax incentives are fairly niche is the flipside of the level playing field – you aren’t penalised for being an overseas investor, but neither are you handsomely rewarded just for showing up. Day-to-day business taxes and compliance are similar to the UK, but always check thresholds. France is a highly taxed country, even if the benefits do come back in other ways. The workforce too, is well protected, even though only a small number of workers are unionised. A system of staff representation from elected spokespersons and a range of work committees applies, depending on the number of employees. So, while you might read that the French economy has plummeted, if you were in France you’d probably read the same about the UK. In relative terms, it’s a robust market. With cultural differences manageable, an equitable market, and short travel times to the UK, France can be the ideal location for Scottish businesses venturing into mainland Europe, particularly those looking for a long term alliance. Dassault Systèmes, the 3DEXPERIENCE Company, provides business and people with virtual universes to imagine sustainable innovations. Its world leading solutions transform the way products are designed, produced, and supported. Dassault Systèmes’ collaborative solutions foster social innovation, expanding possibilities for the virtual world to improve the real world. The group brings value to over 190,000 customers of all sizes, in all industries, in more than 140 countries. Chris Viehbacher, Chief Executive Officer of Sanofi, poses for the media before the company’s 2012 annual results presentation in Paris February 7, 2013. Source (Reuters) – Sanofi SA is looking to sell a portfolio of older drugs that could fetch $7-8 billion, according to people familiar with the matter, yet another example of drugmakers trying to shed non-core assets and focus on high-growth areas. The French pharmaceutical firm has hired financial advisers Evercore Partners Inc to help it with a deal and has contacted potential buyers in the past few months, the people said, asking not to be named because the matter is private. The drugs for sale include treatments for high blood pressure and cardio-metabolic diseases and account for roughly $3.7 billion in combined annual revenue, one of the people said. The portfolio could fetch up to two times that amount, the person added. Shares in Sanofi rose 1.5 percent in early trade on Wednesday following the news. Generic drugmakers and specialty pharmaceutical companies are seen as logical buyers for the portfolio, said the people familiar with the matter. A spokesman for Sanofi said: “We do not comment on market rumors.” Evercore also declined to comment. Novartis AG last week announced a major revamp in which it traded more than $20 billion worth of assets with GlaxoSmithKline Plc and agreed to sell its animal health arm to Eli Lilly and Co.
Merck & Co Inc is also in the final stages of selling its consumer health unit for close to $14 billion, Reuters reported last week, as its market share in the sector is seen as sub-scale compared with those of market leaders. The Novartis deal, in particular, is seen as a template for others in the pharmaceuticals industry to follow and it could also apply to other industries, such as consumer goods. Sanofi has an extensive line-up of older products that could be carved out, following similar moves now under way at Pfizer Inc and GSK to place older products in separate divisions. Pfizer announced last year it planned to separate its business into three units – innovative pharmaceuticals; vaccines, oncology and consumer health; and established products – and the U.S. group has not ruled out a full breakup. GSK is starting out down a similar path and will announce the first separate results for its established products business when it reports quarterly results later on Wednesday. Sanofi Chief Executive Chris Viehbacher said on Tuesday he did not plan to embark on large-scale deals, despite a current merger frenzy in the healthcare sector, but would continue with a strategy of smaller transactions and bolt-on acquisitions. Drug candidate blocks production of disease-causing neurotoxins in mouse models. Much AD research has focused on the APP-cutting enzyme BACE1 β-secretase, but its role in producing pGlu-Aβ was unknown. Cathepsin B is an alternative -secretase which cleaves the wild-type β-secretase site of APP, which is expressed in the major sporadic and many familial forms of AD. Hook and colleagues looked at what happened after gene knockout of BACE1 or cathepsin B. They found that cathepsin B, but not BACE1, produced the highly toxic pGlu-Aβ. Disclosure Vivian Hook is chair of American Life Science Pharmaceuticals’ scientific advisory board and holds equity in the company. SAN DIEGO, March 28, 2014 /PRNewswire/ — Halozyme Therapeutics, Inc.(NASDAQ: HALO) announced today that the European Commission (EC) has approved Roche’s new subcutaneous (SC) formulation of MabThera® (rituximab) for the treatment of patients with follicular lymphoma and diffuse large B-cell lymphoma. Following the approval of Herceptin SC in September 2013, this is the second European approval for a novel subcutaneous formulation of one of Roche’soncology products using Halozyme’s patented Enhanze™ (recombinant human hyaluronidase) technology. The European approval was primarily based on data from the pivotal SABRINA study, which was recently published in the Lancet Oncology[i]. Roche has stated that they expect to begin launching MabThera SC in a number of European markets throughout 2014. There are two main types of lymphoma: Hodgkin lymphoma and non-Hodgkin lymphoma (NHL). NHL represents approximately 85% of all lymphoma diagnosed[ii] and was responsible for approximately 200,000 annual deaths worldwide in 2012[iii]. Lymphomas are a cancer of the lymphatic system (composed of lymph vessels, lymph nodes and organs) which helps to keep the bodily fluid levels balanced and to defend the body against invasion by disease. Lymphoma develops when white blood cells (usually B-lymphocytes) in the lymph fluid become cancerous and begin to multiply and collect in the lymph nodes or lymphatic tissues such as the spleen. Some of these cells are released into the bloodstream and spread around the body, interfering with the body’s production of healthy blood cells. In December 2006, Halozyme entered into an agreement with Roche to apply Halozyme’s patented Enhanze™ technology (recombinant human hyaluronidase or rHuPH20) to Roche’s biological therapeutic compounds. To date, Roche has elected to explore the use of rHuPH20 for up to a total of five exclusive targets, and Rocheretains the option to apply rHuPH20 to three additional targets through the payment of annual license maintenance fees. Subject to the successful achievement of clinical, regulatory, and sales events, Roche will pay Halozyme additional milestones as well as royalties on product sales for Herceptin SC, MabThera SC and any other product candidates which would be successfully developed and commercialized under the agreement. Halozyme Therapeutics is a biopharmaceutical company dedicated to developing and commercializing innovative products that advance patient care. With a diversified portfolio of enzymes that target the extracellular matrix, the Company’s research focuses primarily on a family of human enzymes, known as hyaluronidases, which increase the dispersion and absorption of biologics, drugs and fluids. Halozyme’s pipeline addresses therapeutic areas, including oncology, diabetes and dermatology that have significant unmet medical need today. The Company markets Hylenex® recombinant (hyaluronidase human injection) and has partnerships with Roche, Pfizer and Baxter. Halozyme is headquartered in San Diego, CA. For more information on how we are innovating, please visit our corporate website at www.halozyme.com and follow us on Twitter@HALOTherapeutic. This release includes forward-looking statements such as the potential benefits of MabThera SC to patients, physicians and the healthcare system, and the possible receipt by Halozyme of future milestones and royalties under the Halozyme-Roche collaboration agreement. The statements are based on assumptions about many important factors, including the following, which could cause actual results to differ materially from those in the forward-looking statements: the approval of product candidates under the Halozyme-Roche collaboration by applicable regulatory authorities; satisfaction of regulatory and other requirements; actions of regulatory bodies and other governmental authorities; issues encountered in the sale of MabThera SC and other product candidates under the Halozyme-Roche collaboration including the countries where the product is approved, approval timelines, the rate of conversion of IV formulation users to SC users, pricing and other commercial factors; unexpected adverse events; changes in laws and regulations; competitive conditions; and other risks identified in Halozyme’s Annual Report on Form 10-K filed with the Securities and Exchange Commission onFebruary 28, 2014. Halozyme does not undertake to update its forward-looking statements. [ii] Globocan (2012) Table by cancers. Worldwide incidence of cancers in males and females.